The leader of Indigenous People of Biafra has finally broken silent over the assault being rained upon Biafrans and innocent citizens. 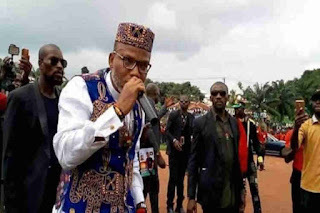 Speaking on an online trending audio/video record which was made available to Eco City Reporters, revealed that Nnamdi Kanu is quite ready to combat the Nigeria govt and other oppressors around but needs 100 men to accomplish this mission. He said: "I am tired of Broadcasting and want to pick up arms and defend my nation's integrity". "I need hundred men to commence war against the oppressors", Kanu Said.